Right now, my house has no landscaping, except for 2 pretty trees in the front yard. A pink flowering cherry tree and a beautiful pink dogwood are the only happy spots in my front yard at the moment, but I’m really hoping that will be changing very soon. To start a landscape project, I am bringing in some folks who have a lot more expertise than I do to create a plan for my yard, the folks from Southern Living Plant Collection. I have long loved dabbling in gardening and have planted my share of shrubs, perennials, annuals and more and so enjoy watching them grow. But, an expert I am not at knowing how to layer them correctly and one of the hardest parts about landscaping is knowing how a grouping of plants will grow and change and what they will look like 5 years from now. That takes a keen eye to plan for the future in landscaping. I’m so excited to get started in my yard and watch it come alive this year. We will take one area at a time and do some fun things around the front yard. There’s a spot for a nice retaining wall which will completely change my yard from the driveway side and then with those 2 flowering trees in the front yard, that is a perfect spot for some under planting of shade plants and mulch creating some curved beds. Curves are so important in a landscape, as I have learned along the way! I love cottage gardens, but my front yard is not really conducive to this look, so I will do a variation of several types of plants and shrubs around the yard, concentrating on the foundation plants around the house and also under the front trees. There is no denying the power of landscaping and how much it changes the curb appeal of a home. Textures and colors in landscaping are such an important part of enhancing a home from the outside. You can decorating a home on the inside, but don’t forget the outside too. Your outdoor areas need decorating too! Hydrangeas are so old South and I have also long loved impatiens and have had them at every house I’ve lived in. Foundations plants of green shrubs are a good way to ground the front yard. Mixing up those textures and greens are so exciting! I cannot wait to get started on the outside of my house, decorating and planting with plants. I have a pretty good green thumb and I know that adding plants to my front yard along with curving beds and even some garden ornaments later on, will completely change the exterior of my house for the better. Now that I’m finished with the inside, it’s time to move outdoors this Spring. Southern Living Plant Collection will be working with me to help me create the landscape plan of my dreams! Some of the plants that are great for the South are these beauties. Hydrangeas are some of my favorite plants. Dear Delores hydrangea is pictured above. 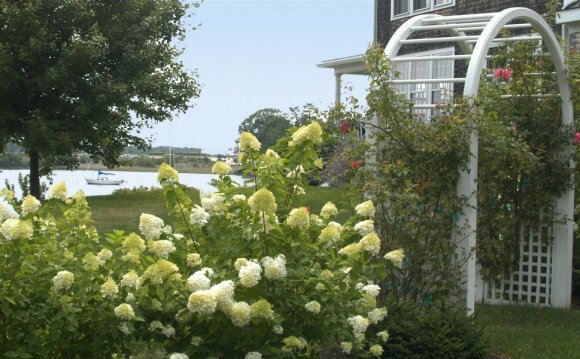 There is nothing more beautiful to me than a flowering hydrangea and I plan to have many of them in my landscape plan. More hardy plants to think about for basic landscaping (from top box down), the Bronze Beauty Cleyera is a great foundation plant and pretty texture and color too. October Magic camellia is also a great choice for plants in the South. Camellias are SO very Southern! Next, hollies are also a Southern staple and Robin Holly has those pretty red berries that we all love. Gardenia Jubliation grows compactly and reblooms through Fall. Nothing smells more sweet than a Gardenia in the South.